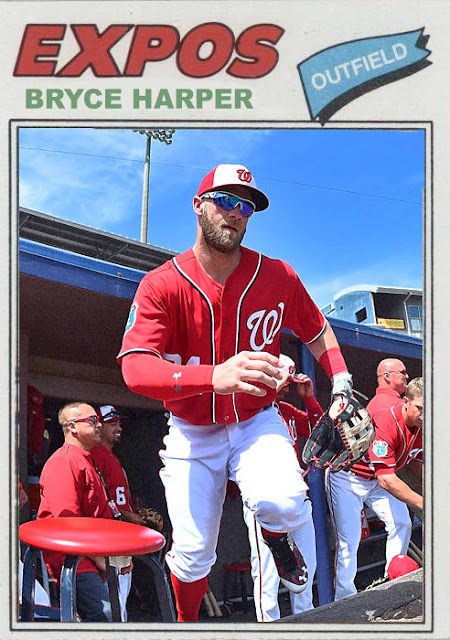 2016 Topps flagship is one of the most underwhelming Topps sets since I got into the hobby. I picked up a rack pack today, and didn't even get any joy out of that. It's more out of civic duty than actually wanting the cards...which is definitely a problem. 303- David Murphy. I believe Murph's signed a minor league deal back with Boston. Hopefully they can use him in some way, despite their influx of young outfielders. 118- Giovany Urshela. Welcome to the 'trapped behind Juan Uribe' club, youngster. 91- Jackie Bradley Jr. One of the influx of Boston outfielders blocking Murph. This one might be starting this year. 363- Brewers team card, The team cards act as checklists...not of the team, but a piece of the whole set checklist, which I'm not 100% behind. 200- Hunter Pence. Screw it, I'm happy again. It's not everyday that one of your favorite players gets a hero number. 37- Santiago Casilla. Not sure if he'll be closing in '16, though. 117- James Loney. Great picture, btw. 63- Piscotty and Carpenter- CARDINALS CLUBBERS! I love the return of these subtitled duo cards. 120- Billy Hamilton, who needs to step up and stay healthy if he wants to be a legitimate threat to Rickey Henderson's throne. 158- Yovani Gallardo, now pitching for Baltimore. 121- Carlos Carrasco. Man, the Phillies wish they hadn't have traded Carlos away. Dude's been pretty amazing as of late. 320- Madison Bumgarner, great player with an inspired pose. 70- KRIS BRYANT. I've seen him up close. He's definitely for real. 443- Yu Darvish. Starting out injured this season, but probably will come back with a vengeance. New Age Performers of Lorenzo Cain. Hell of a choice for one, too. 389- Jeff Samardzija, photoshopped into a Giants uniform. 188- nL Rookies. Haven't heard of either. 97- Carlos Beltran. Dude's 8 away from 400 home runs, he's 57 away from 1500 RBIs, and 46 away from 2500 hits. I think he's a Hall of Famer, and hopefully the sportswriters will agree with me. 52- Jason Hammel. When a guy who had a 3.74 ERA last year is your #4 starter, you're doing things pretty damn right. 424- Domonic Brown. Ah, boo hoo. 391- Mike Fiers, who'll be the #5 man for Houston, which is pretty nice. 423- Pence & Belt- FENCE BUSTERS. Love this one too. 223- Mike Zunino. Nice try, though. 281- Anthony DeSclafani. This guy's supposed to be the #1 starter in Cincinnati this year. Oh, how the mighty have fallen. 313- Seth Smith. Glad to hear he's still doing well. 285- Mike Leake. I forget where he signed, but I don't think he's back with the Giants this year. 199- Shawn Tolleson, new and improved Arlington closer. 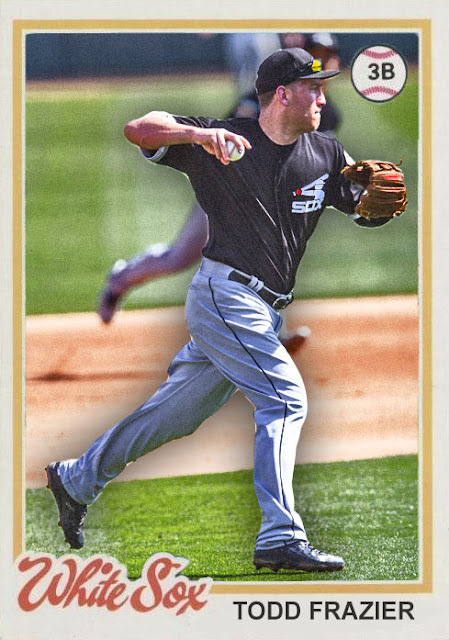 59- Kyle Hendricks. 5th starter for Chicago, and still a pretty nice choice. 12- Andre Ethier. Juuust landed on the DL. 405- Adrian Beltre, another guy who might be a Hall of Famer someday. Maybe. Great product, with cool photography and fits in well with the original. Whether you love him or hate him, you have to at least appreciate what Bryce Harper has done for baseball. He's brash, he can be annoying, but he's become an imperfect face for a sport that needs some new heroes. Halfway through last season, when the Nationals completely collapsed, Bryce Harper kept hitting and pounding until the very end of the season, and he got a well-deserved MVP for that. He's finally proved he's capable of full-season production, and is a ton more than just a reputation or rookie status. Now...he's got to prove he's more than just a one-season wonder. Because as awesome as 2015 was, he has to give an equally impressive 2016. Hopefully, he'll have a more impressive surrounding roster, so that he can also work toward postseason gain in addition to attempting another MVP. Coming Tomorrow- A pitcher for a team that's just polishing off their rebuilding to seal the deal again in 2016. The one problem people had with the NL Wild Card last year, the one-game playoff, is that it totally took power away from the one team that was in power in the Wild Card race in the first place. The Pirates were fighting with the Cardinals for first for the entire season, and it was pretty cutthroat. For the latter half of the season, they had the handle on that WC spot, the first one, and the Cubs had even more of a handle on the #2 spot. For the entire last month of the season, the two Wild Card spots were locked up. So, arc-wise, it made no sense that the Cubs easily took down the Pirates to advance. They were ahead the whole time. But, really, this was the year of the Cubs, and them going ahead was a little easier to stomach. This outcome, and the fact that the Cubs spent the offseason rebuilding, and also the fact that the Cardinals are the Cardinals, does not bode will for the Pirates in 2016. They've lost Neil Walker, AJ Burnett and Pedro Alvarez, the guys that were holding the team together the past few years, and they're rebuilding by picking up spare parts. Which...is not the best sign. I mean, they still have the outstanding outfield combo of Andrew McCutchen, Gregory Polanco and Starling Marte, and they still have people like Francisco Liriano and Josh Harrison, so it's not entirely lost, but unless something amazing happens, there's not the greatest chance of the Pirates making it back to first this year. 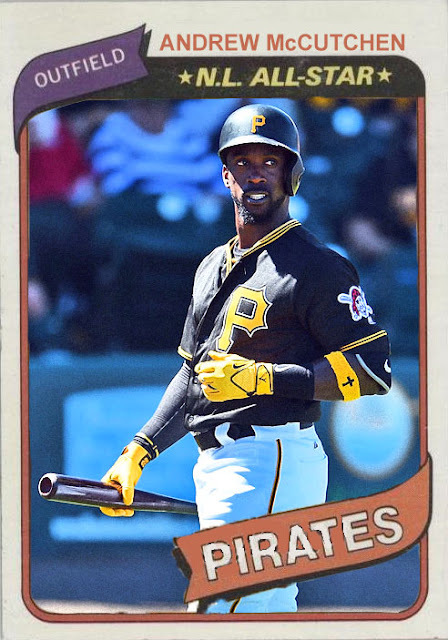 I'm still hoping for another amazing season from Cutch though, as I always root for that guy. Coming Tomorrow- The most important hitter in the game right now. You see...THIS is the proper way to avoid injuring someone who is sliding into second base. 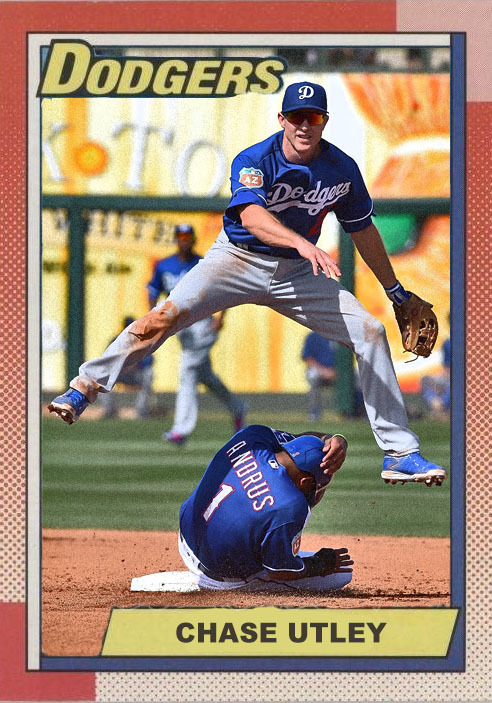 I actually think this card is perfect, because it makes me think of what would happen if Andrus did the same thing Utley did last year. What if he gave his nuts a haymaker or something, or just flat out tackled him? No, he's doing the proper, 'duck and cover' formation, mostly because Chut probably just tagged him out. Actually, come to think of it, if he WAS out, he'd still be pretty angry, so he could, theoretically, still do a Chutley move towards Chutley. It wouldn't necessarily be out of bounds. Contextually, people would get it. Right, right, away from the 'Chase Utley hurting Wilmer Flores while sliding' jokes. Utley is fighting for a spot in a very crowded Dodgers roster. The infield is probably going to include Adrian Gonzalez, Corey Seager and Justin Turner, which already is slightly imperfect, as not everybody's on the same page. You've got a big hitter, a young kid who's mostly a defensive player, and a guy who isn't especially known for either. Needless to say, it's scattered. Howie Kendrick is probably going to start at 2nd, making Chut either a backup or the main option if Kendrick lands on the DL again. Chase is running out of healthy, consistent time at 2nd, regardless of the nice season he had in 2014. He's slowing down big time, and I won't be surprised if he doesn't exactly impress this spring, or if they bring in a rookie in May to render him obsolete. Basically, people are watching Chase Utley for what he was, not what he is. And to reiterate, they're watching for the awesome, Philly star Chase, not the vengeful piledriver from last October. Coming Tomorrow- Last custom I have on the workbench before I need to make more. First one that isn't wearing a new-ish uniform. The guy who's going to have to fight to stay relevant in the NL Central. This was actually the first custom I made this year. I figured I'd save it for later because I was banking on getting a bigger sell for the 'first custom of the year' honors, and I did. Not to diminish Todd Frazier's efforts. He's a Toms River boy, and he damn near obliterated the Home Run Derby last year, in Cincy. He's an excellent player, that's for damn sure. Yes, all these new elements have been brought in, but I'm not sure if everything's going to work. I feel like Ventura and co. are trying to recapture what the other Chicago team did. Only problem is the other Chicago team made it a point to have a strong foundation and farm system before they brought in all the new contracts and started winning. The Sox...they have Jose Abreu, and Adam Eaton, and Avisail Garcia, and Chris Sale...but they don't have a fully-formed team. They have a couple question marks at important positions, even in Spring Training, whereas the Cubs basically have everything ironed out. Frazier hopefully will work well in the AL, because he was outstanding on the Reds. This is a guy who has broke out big time, and can hit 30 to 40 homers per year. He's got the right idea, and hopefully that will translate well to some AL success. Coming Tomorrow- The guy that Mets fans want to kill, Phillies fans want to mourn, and Dodgers fans...want to play solid second base? This was going to be my 'First Custom of the Year', but Greinke has already got the 1st-of-the-year treatment, back when he was a recent signee with the Brewers in 2011. So J-Hey got the nod. 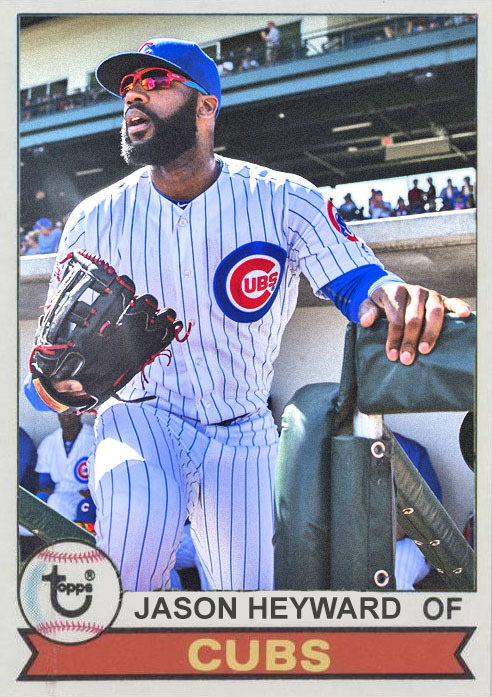 Still, a ton to love about this card. 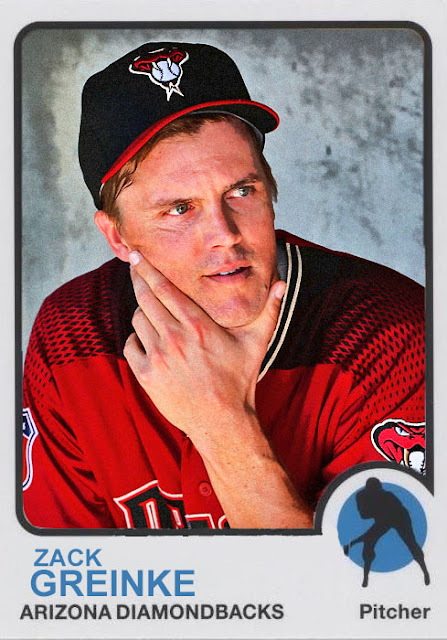 True, it's going to be tough for the Diamondbacks to live up to the reputation of their offseason, but at least Greinke will give you a ton of strikeouts. I'm not sure if he's going to singlehandedly bring the team to October...but it would be kind of nice. Tomorrow I'll post one with a bit more substance to it. I've got two more in storage and then I have to wait for more pictures to pop up, so tomorrow's is another big team-changer, another one from Chicago, too. I had options this year, for the big ol' 'FIRST CUSTOM OF THE YEAR' distinction. I had a guy who signed a mega-deal with a middle-of-the road team, a guy who signed a smaller deal with a worse team, a guy who pissed off all of New York last October, and Jason Heyward. So I chose J-Hey. And judging from the look of this card...I chose wisely. Gonna be a good 2016. For Heyward, for the Cubs, and for Custom Cards.